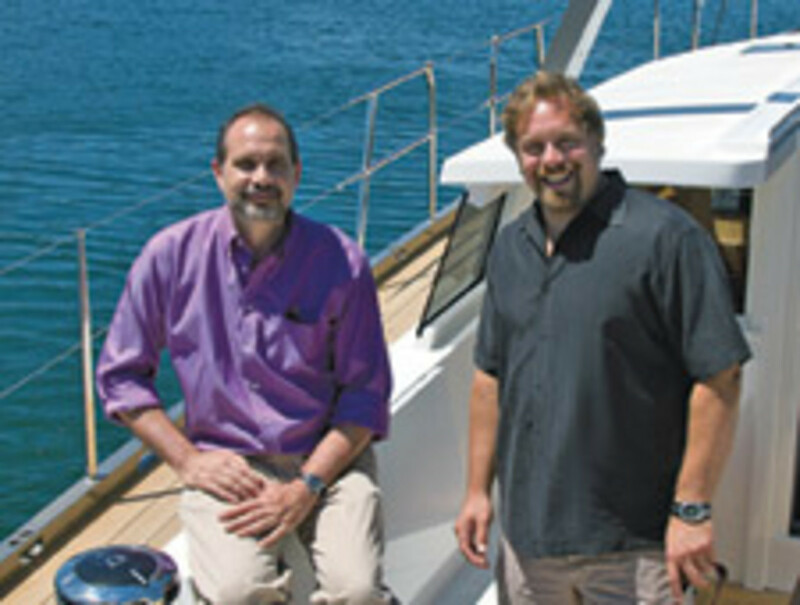 This month, I’m looking at two design concepts from Stephens Waring Yacht Design in Belfast, Maine. They are just concepts at this point, and Paul Waring has taken the unusual step of offering them for critique, which shows intellectual inquiry, an open mind and more than a little courage. I wish more designers would do the same. The two boats are of similar size but with different missions. 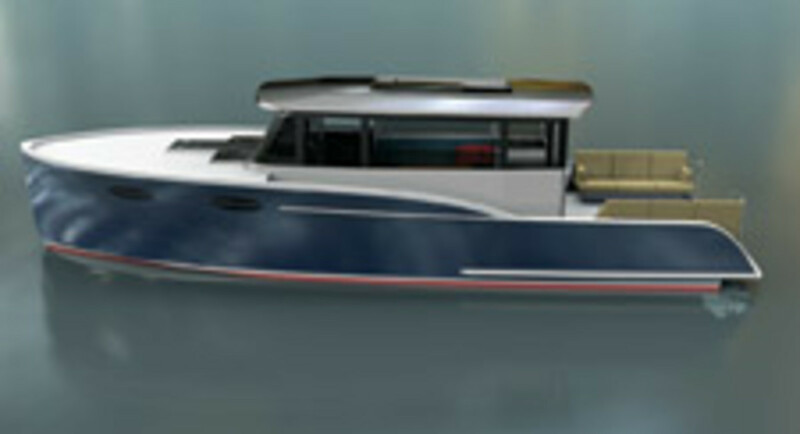 Paradigm is described by her designer as a 40-foot sport utility vessel. 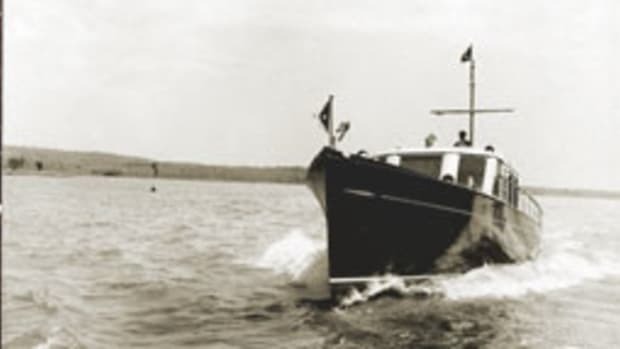 Citronella is more of a classic cruiser, a 44-foot sedan with pod propulsion. Although I would make changes in the name of practicality and offshore capability, the concepts have much intrinsic merit, and the suggested changes are mostly minor and easily implemented during the design phase. In any event, these boats are far more interesting to me than many production boats on the market. Both could be built as one-offs, using cold-molded wood, or female tooling could be created for series production. Let’s have a look. Paradigm is a quirky and in many ways appealing hybrid, a mix of the flush-deck cruiser from the first half of the last century topped off with a Jeanneau-like deckhouse — all glass outside and sunshine inside. The multi-angled pilothouse is generally rectangular rather than running parallel to the gunwale, which results in slightly wider side decks forward than aft but seems to be a key element in the boat’s angular look. I see a sort of dance between the very different hull and the deck components, an attempt at reconciliation between fire and water, the past and future. I like much of what Waring appears to be trying to do with the boat’s lines. He seems to be creating a dialogue between the hull and the deckhouse, and in this case I think it works well, but I believe that he is less successful in creating aesthetic consonance within the hull itself. I look at the bow, with its essentially plumb stem and moderate flare, and the flush deck — all very 1940s-looking — then look aft to find the stern profile of a Tiara Sovran or similar contemporary yacht. I will assume my lack of imagination prevents me from seeing the congruity here. The swept haunches (a term I picked up while working on a Tiara build project) at the stern don’t flow naturally from either the stem or the deckhouse. This is especially the case with the angular port and starboard settees in the cockpit, which from a distance will become the hull profile back aft. But this is all a matter of taste. “Both read the Bible day and night, but thou read black where I read white,” said William Blake. Although the settees might appear to be an afterthought, Waring notes that the concept revolves around flexibility. “These seats allow multiple uses of the cockpit space and can be easily removed for a more water-sports-oriented family,” he says. 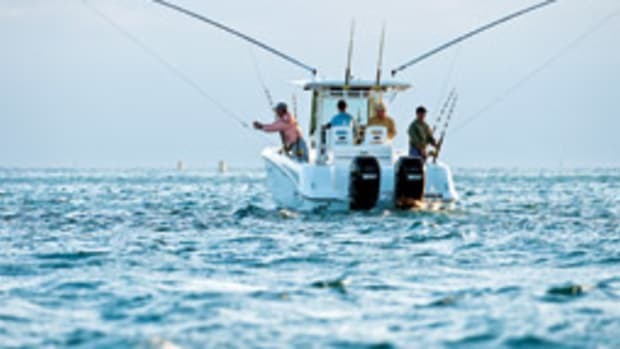 As with similar exposed seats, make sure to keep them covered at sea so they are dry when you drop the hook. I would be concerned about the step leading down to the swim platform. A person standing at the aft end of the settee might fall, given the inset step’s proximity to the seat. I would add a railing around the step’s perimeter in the absence of an actual transom, given that the stern and bow are areas that most need passenger protection. I also would have the platform extend aft well past the raised sterndrives. Someone slipping off the edge of the platform, as drawn, for a quick dip might land right on the sterndrives’ ventilation plate, even when they’re fully lowered. The cockpit level continues unbroken to the inside of the pilothouse. This is a theme that more builders have been playing up — the advantages of no steps from stern to helm. Another popular theme here is the galley in the pilothouse, rather than forward in the cabin. This keeps the chef in the crew’s midst and makes it easy to serve people who will typically be topside, anyway. Waring says he wanted to have enough interior for multigenerational outdoor activities. “The side decks are important for the security of small children and to provide good access to the foredeck on both sides,” he says. I appreciate the security of the side decks, but you end up with such a small interior, and the pilothouse/saloon is the most-used area on a boat such as this. A more functional design, at least for those who don’t venture forward very often, would be to put a recessed side deck to starboard, where a sliding door can be added at the helm for easy communication and quick access topside. On the port side, have an 8-inch-wide, gunwale-level side deck that also affords access to the bow but for the more agile. You’d pick up a good foot of usable width inside. Although a bow without rails presents a clean look, it’s also unsafe. I hope the designer and owner will opt for a set of strong and stiff 30-inch rails extending from the forward end of the house to the bow. There also should be handrails along the deckhouse overlapping by several feet with the bow rails so the sojourner has something for support at sea — and for a few feet, two separate handholds. Waring agrees. This detail was left out in the concept phase. As high-efficiency hulls go, this one has minimal wetted surface, which helps, as does its projected moderate displacement. 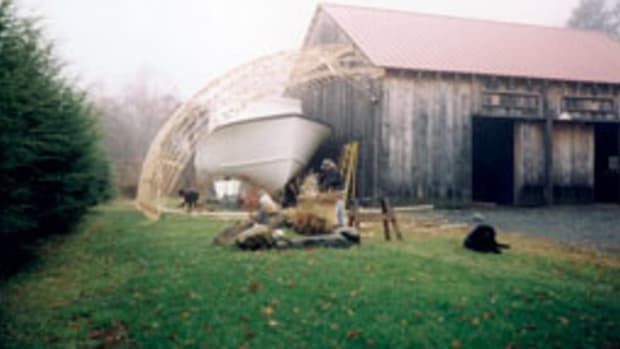 A waterline length/beam ratio of 3.15 (37 feet, 3 inches by 11 feet, 10 inches) is on the wide side for such a boat, although it is narrower than many production boats, so that works against seakeeping and efficiency. A longer and narrower boat of the same size is more seakindly and efficient. Judging from the renderings, it appears this could be a wet boat at speed, but Waring says he would add strakes, which would help it run drier. The hull’s chine elevation is not high forward, which indicates less deadrise below and, therefore, a harder ride in a chop. 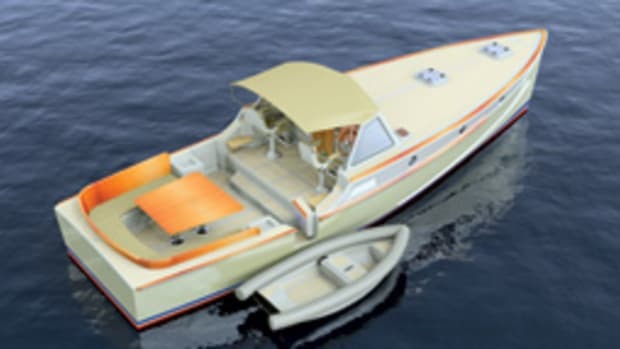 The designer’s rendering also shows shoal draft forward, which makes the boat harder-riding than one with a deeper bow and also more susceptible to a crosswind. Also worth considering, the angle of entry appears to be quite fine, so the head-sea ride should be fine in a light chop, if not in 3- to 4-footers in coastal waters. Standard power is a single Volvo 370-hp Yanmar sterndrive delivering a projected top speed of 20 knots. This speed prediction sounds about right, provided that the boat comes in at its design displacement. A buyer also might consider inboard shaft power, especially if opting for the single engine, because a well-designed inboard can be every bit as efficient as a sterndrive below the mid-20-knot range. Citronella is a classic cruiser of seakindly proportions powered by Volvo Penta IPS pod drives. It’s obvious in the details and the overall look that the designer has a love for classic roadsters as well as commuter yachts from the 1920s and ’30s. This is the sleeker, more retro yacht of the two presented here. She is meant to be a swift cruiser, with twin pods driving her to a 32-knot top end and a 28-knot cruise. There’s room for a couple to cruise, and she serves as an elegant dayboat for short excursions or entertaining. IPS power makes the boat a cinch to drive, which is a big reason for the pod propulsion system’s great success. 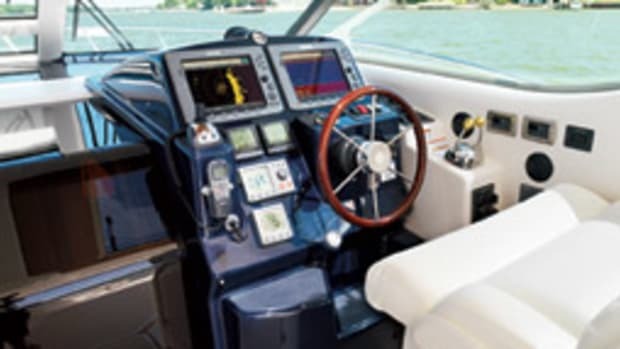 If you are not a proficient boat handler, you want your family to be able to drive the boat or you just worry more than you wish to when maneuvering in close quarters, the joystick control is an option. 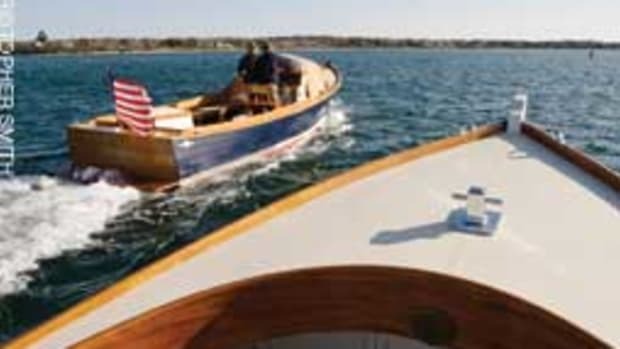 “While Paradigm has a mission of family enjoyment connected to the water, Citronella has more of a mission suited to older couples who want more cruising or cocktail lounging without the grandkids, perhaps more of a spinoff on the Hinckley Picnic Boat idea,” Waring says. Her flush deck pitches forward — or at least it seems to visually — and absent any windows or ports the owner adds during the design phase, she will be dark below. I’d add hull-side windows up high to flood the interior with sunlight. The windshield looks like a huge piece of glass creased down the middle, so visibility ahead should be exceptionally good as long as running trim is modest — 3 or 4 degrees max. A broken sheer creates high freeboard for ample headroom in the cabin while sweeping down to a curved transom that looks like a mix of Hinckley tumblehome and the reverse slope of a True North. Although some might point to the space that such a design wastes, the upside — in addition to creating curvaceous quarters — is that it helps to keep the stern light because there’s no room to put anything. This, in turn, especially improves her semiplaning performance. One thing’s for sure: It will be hard for the ocean to find a way aboard either end of this boat. 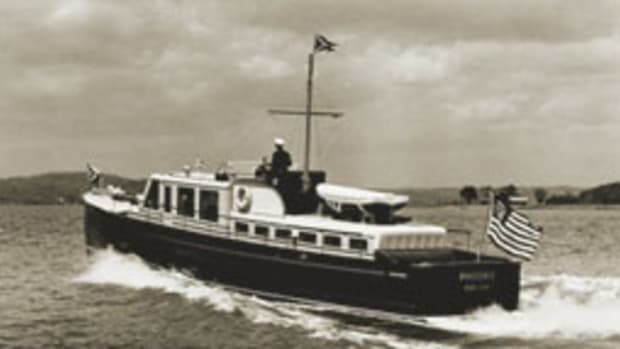 The coach roof stretches nearly half the length of the boat, enclosing the pilothouse with its huge windows and covering the better portion of the cockpit aft. If the side windows were thick plastic, this would be a similar to Bob Johnstone’s MJM series, opening the saloon to weather when the mood strikes and weather permits. On top is a large sunroof to let still more sunlight into the saloon. The cockpit overhang also has a sunroof. 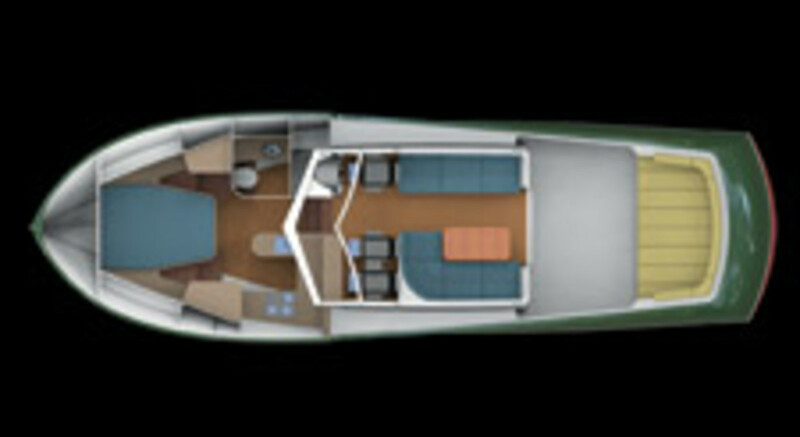 Options include a leather cabin top, side-to boarding platforms, and teak decks and trim. Make sure you add those hull-side doors if you decide to build the boat. Entering from the cockpit, the saloon has a straight sofa to starboard and an L-shaped settee with table to port. Forward to port is a pair of pedestal seats for the co-pilots, and the helm is opposite to starboard. The U-shaped galley is below to port, the head is opposite, and an island berth and twin lockers are in the forepeak, as on the Paradigm. The side decks are flush with the gunwale. With the deckhouse being rectangular and the hull sheer sweeping inward in plan view, the result is very wide sidedecks forward that taper to half their width at the cockpit. They lead to a flush deck forward, interrupted only by a slight raised trunk on centerline for added headroom below. 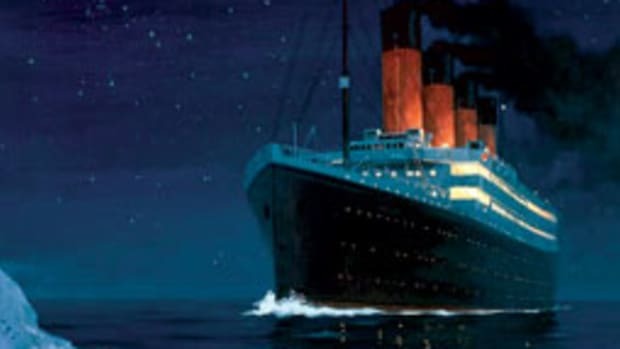 Every boat needs a means of getting a person who falls overboard back on board, so without a stern ladder, be sure to specify a ladder design at one of the side doors, preferably the one to starboard because that is the side on which the skipper can keep you in sight while making an approach. I think Waring is on to something with these design concepts, and I hope our dialogue will prove both instructive and, even better, entertaining. 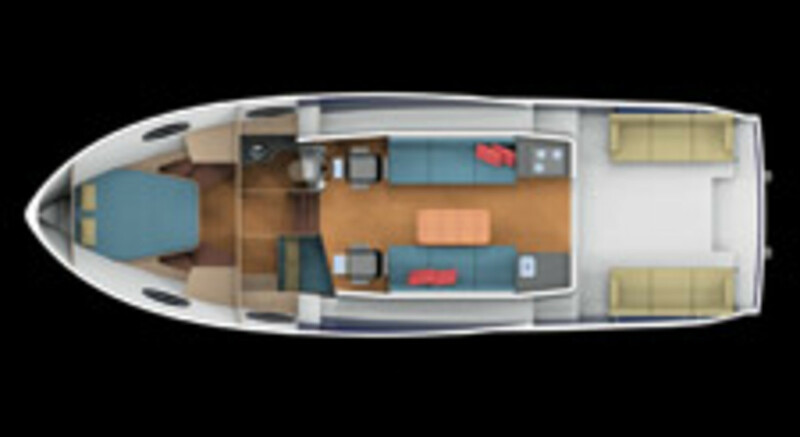 Paradigm is more of a cruiser, with a larger enclosed saloon, a galley-up for better accessibility to the cook and better water access from the stern. She has a unique look with the classic lines, especially the flush deck forward and the Euro deckhouse. Citronella is more the MJM-like dayboat, with a good bit of her topside space open to the air. She is less practical as a sport boat, with no easy water access, though with the side doors added she would be easier to get on and off from the dock. Her stern bustle is an extravagance, but style-minded owners will come down squarely in that court. After all, the Zeelander, with its far more extravagantly space-consuming hind end, seems to be selling at a brisk pace. A few details need to be sorted out to make these designs more practical and safer topside, but I applaud the direction taken and the intelligence evidenced. I had no 3-D renderings of the interiors, but with all the glass and the narrow window mullions, it looks as if visibility from their helms would be excellent. As long as the helm ergonomics are nothing like a sailboat’s, with the typically hard to reach vertical wheel and hard to see instruments, there is much potential here. These are inshore designs with modest deadrise, shoal draft and high windage, but they would be a blast to bomb around Casco Bay in during the summer, and both are head-turners, for sure.